Well, could Spring have finally arrived today in Scotland? We know how to make the most of such brief opportunities, particularly any sunshine that does decide to appear. 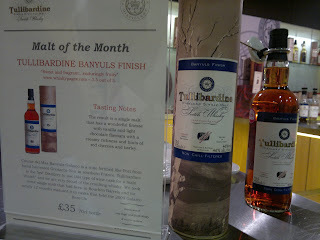 So a trip into Perthshire and the Tullibardine Distillery was a welcome drive, and what turned out to be a refreshing visit. Set on the village of Blackford, Tullibardine is in picturesque Perthshire, just a short drive from the major motorways and world famous Gleneagles resort. The distillery makes the most of the 1488 date, as there has been a distillery/brewery on this site since then, making the most of the local spring that also supplies Highland Spring; a Scottish water company you may have heard of previously. 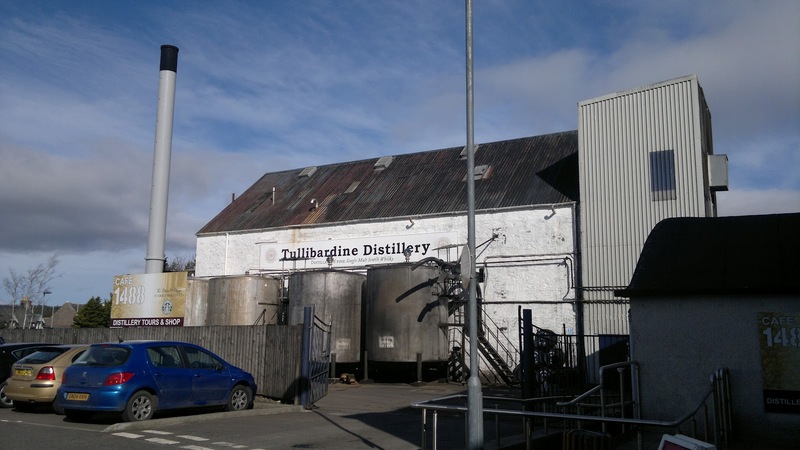 After being mothballed like so many distilleries in 1993, it is now making a fightback and establishing its own identity. 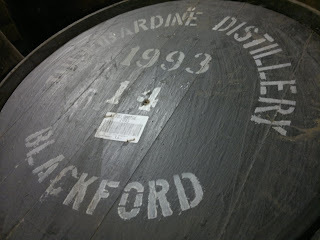 After a local takeover it has more recenlty been assisted by a recent buyout by French giant Michel Picard, who also supply some of the used casks; giving the whole operation a nice symmetry. 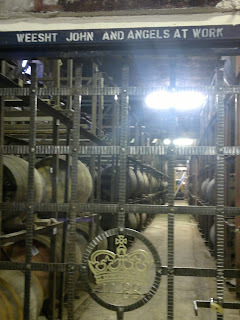 Even with my vast experience of distillery tours, it still surprises me how different and characteristic each visit can be. For instance Tullibardine is a small distillery, but by far not the smallest. 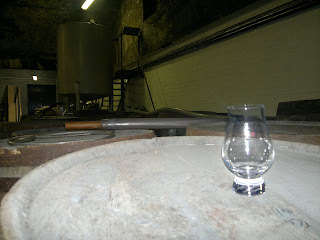 In comparison Benromach is smaller and the forthcoming Edradour is the smallest. 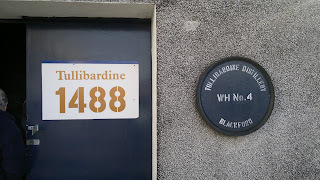 However Tullibardine is a 24/7 haven of production, with the staff on 12 hour shifts to meet demand. So for us on the tour it was a great opportunity to see everything in full production and the clatter, heat and aromas it brings. 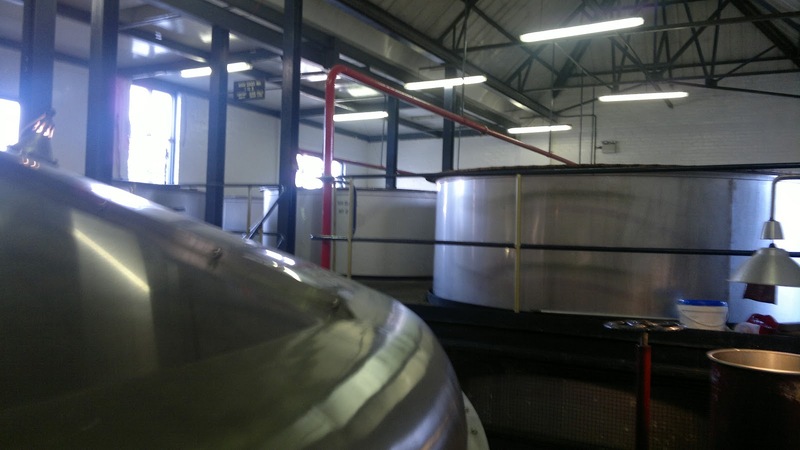 There is only 1 mash tun here, only 8 washbacks (made of metal) and four stills. What made this more interesting was the various stages we were able to see and thanks to the excellent tour guide, we were encouraged to use all our senses. All of these 3 stages of production are under a single roof, and interestingly a single room. So it's possible to see and hear everything within the one area. Even though the stillman was working way, we were allowed into the still area, with the characteristic condensers evident, radiant heat and the swooshing of spirit. Marvelous stuff! Moving out of the production area, the tour takes you to where the casks are filled and the cooper makes good any repairs. Again, we were encouraged to use our senses and smell the difference between an American and European cask. Before gazing longingly down the locked warehouse, where the angels do their work alongside mother nature. Sadly the renowned John Black wasn't around, as quite often during weekday tours he can be spotted doing his work selecting casks. The distillery offers several different tours and I'd advise always booking in advance to ensure you have your desired choice. Until recently you were allowed to take photographs during any part of the tour, but a recent indiscretion from a visitor and Facebook meant that the production area is now off limits. This does not detract from what is a charming tour with a enthusiastic guide who loves whisky and such a passion really helps. Now the best part of any tour is the tasting. 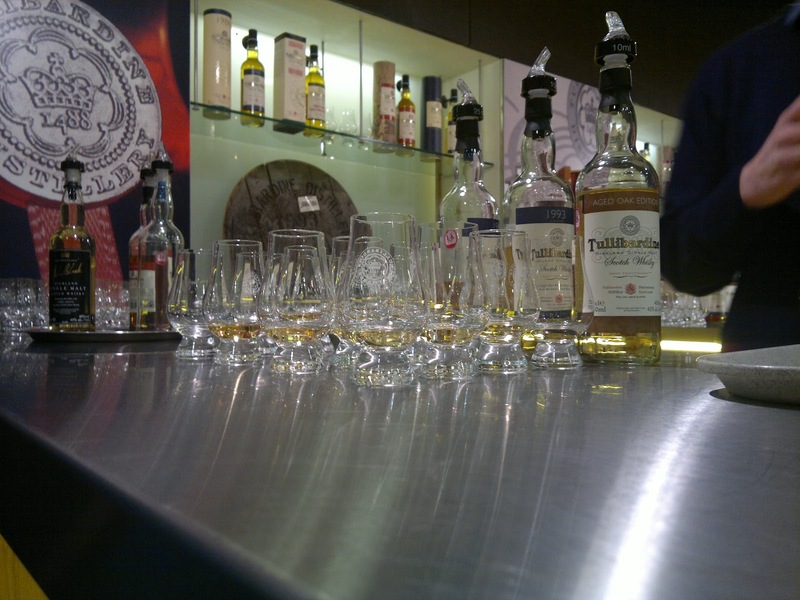 Tullibardine has a well equipped tasting room at the end of the tour that displays the various ranges they sell. Most of their malt goes for blending and because the distillery was mothballed for several years in the 90's, there is a noticeable gap. Yet our tasting was very generous as it included new spirit, the Aged Oak edition, 1993, 1988 and the unique Banyulas finish. Our small group were big fans of the 1993 and 1988 bottles; both would be recommended. I'd also say the Aged Oak edition was a surprise given my recent bitter dislike of the Tomatin oak release. Yeah, I did enjoy the kick of the new malt! This wasn't watered down and until recently was actually sold at the distillery. 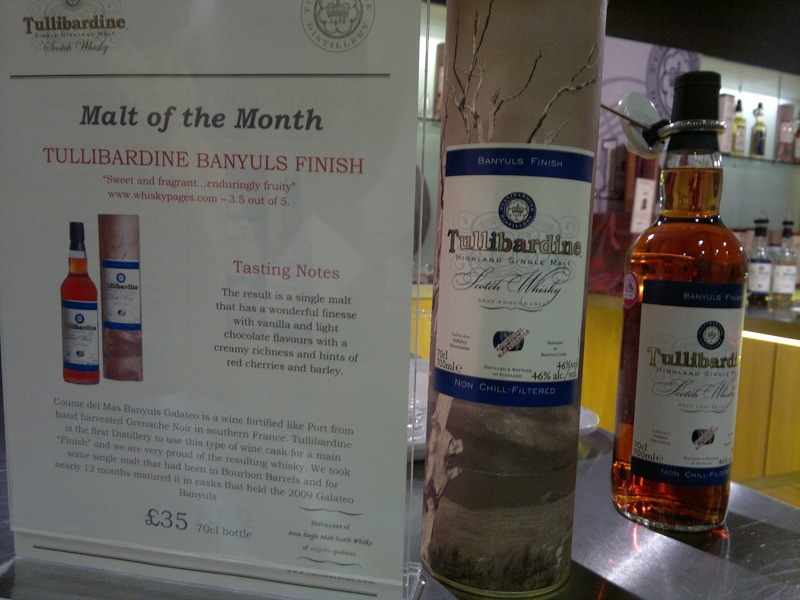 I was already aware of the Banyulas release due to Jim Murray's less than favourable review in his Whisky Bible. The first whisky to make use of specific fortified wine casks from Southern France it truly is unique; almost Rose wine like in appearance with a confusing aroma. The initial taste is unpleasant but the finish is long and inoffensive. 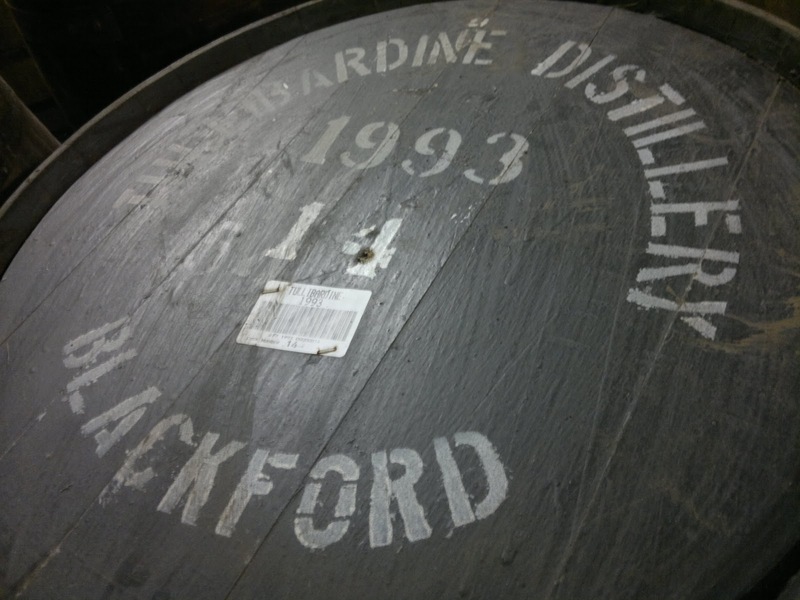 If anything, it really shows what just a few months in a cask can do, to finish off a whisky or murder it. A well stocked distillery shop rounds off your visit and there's also a Starbucks for refreshments, a bite to eat or even a dram! 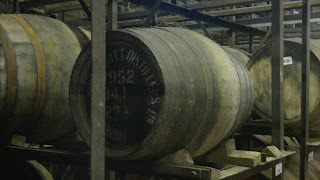 Overall, a really enjoyable day out and it's a shame there aren't more Perthshire distilleries nowadays. 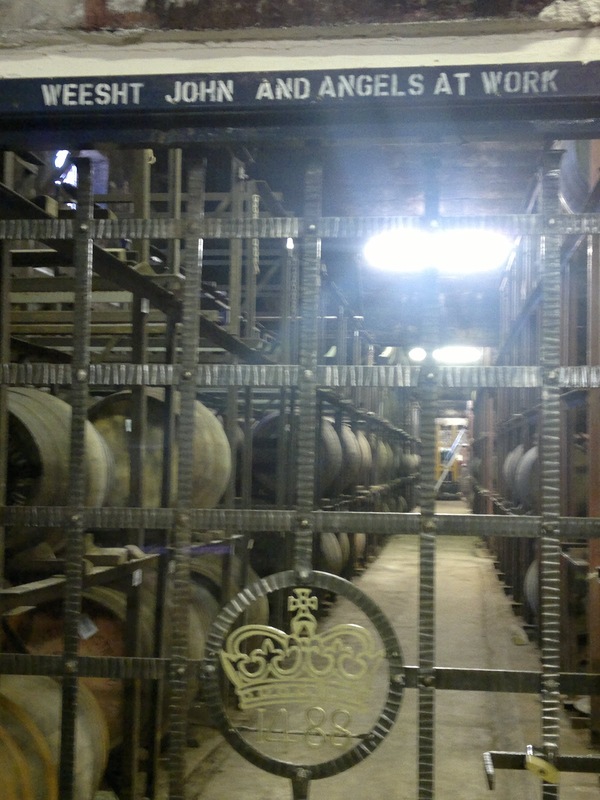 Probably the highlight was the 1952 cask (pictured below) which is now only about a quarter full, with enough for 50 or so bottles which will be bottled later this year to celebrate the Queen's coronation. The price, well any chance I had of this was removed by the fact this is going to be an incredibly expensive at around 10 grand. As always all the photographs are available right here, in total there's about 70 for you to enjoy if you cannot make it along to Tullibardine distillery.